Royal Icing made with pasteurized or raw egg whites has a perfect consistency right from the initial batch. The reason for this is that you do not add any measure of water to it, like you must for recipes that use meringue powder. Consequently, I recommend that you use an egg white-based recipe exclusively. Of egg white-based recipes, there are two types: “Crispy,” which only consists of powdered sugar and egg whites (plus a touch of flavoring), and “soft,” which is the same recipe, but with added light corn syrup. Your objective when mixing Royal Icing is to mix it to a consistency that meets your design needs. For very exact piping, you need a stiff consistency, but the stiffness of that consistency is different whether light corn syrup is used or not. 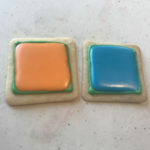 A looser, or flow consistency, is used to make smooth, flat surfaces over the top of your cookies or within a designated area, like seen at the beginning of this article. The initial batch of Royal Icing with egg whites provides a perfect, very stiff-but-slightly-elastic consistency when it contains light corn syrup. Without light corn syrup, the batch will be very stiff and un-elastic. The picture below on the left shows this batch completely settled into a flat, glossy surface. Soft but firm Royal Icing makes very good borders, which you see on the right. Crispy Royal Icing can make much more precise borders which you might prefer if your design is highly detailed. To make icing liquid enough to flow, add water to your batch by half-squeezes of water through a food grade (glass) spray bottle. How do you judge? Disturb your icing and observe it flattening. If it hardly flattens, it is too thick, or if it runs smooth like water, it is too thin. If you load your piping bag and the icing quickly runs out, it is too thin. If, however, your icing needs to be squeezed out, and once out, it barely changes shape, or it tends to ripple, it is too thick. I like to flood icing into a border, like seen in the above picture. If it is too loose, it will flow over the border. If it is too stiff, it will be hard to nudge the icing next to the border. How can you tell? If you are unsure, create some test areas. Pipe borders on clear plastic sheets or parchment paper, let them dry for 15 minutes, then test pipe your flow icing into them. The initial batch of Royal Icing that uses pasteurized egg whites without the addition of corn syrup makes a perfect “stiff” consistency. Add very tiny amounts of water to thin to an appropriate consistency. Determine the consistency by testing to determine if the icing does what you want it to do. Rather than frost a cookie, I pipe my tests on a clear plastic sheet by Grafix Clear Craft Plastic. If you add too much water, thicken your mixture by adding very tiny amounts of sifted powder sugar, or add some of your original stiff batch to the mixture. Use a recipe based on pasteurized egg whites. Weaken the initial batch to flood stage, rather than stiffen a batch you made too weak. Limit the addition of water to very small amounts, preferably by using a spray bottle, a half-spray at a time. If you are unsure whether the consistency you made is correct, test by piping it onto a clear plastic sheet or parchment paper, then observe its behavior.